CDL-A Drivers: All Our Extras Add Up At Summit! Heavy Team Miles! New Units Arriving Monthly In The North Baltimore, OH Area! As a specialized, light-weight load carrier with over 23 years in business, Summit Express is a values-driven, growing, mid-west carrier that provides one of the best, well-rounded driver packages out there. With 70% of our customer base using our services for over 13 years, Summit Express is also able to offer top miles to teams week over week, 75% drop and hook loads, multiple accessorial pay opportunities and multiple bonus opportunities. Our dispatchers average 15+ years’ experience, and successfully works with each team to meet their individual operating needs. 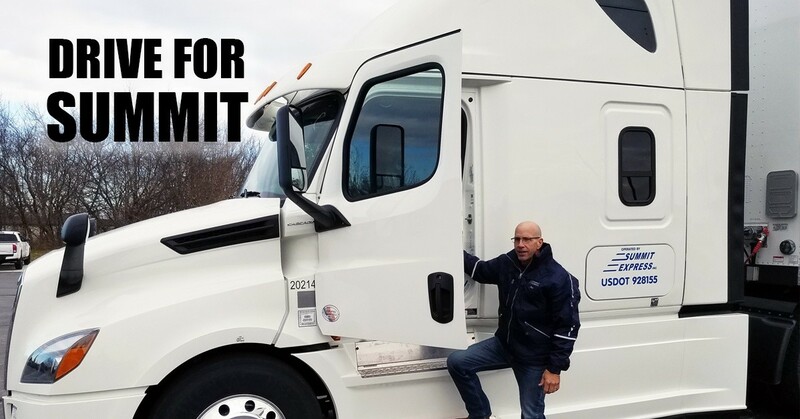 For drivers looking to elevate their career a notch, Summit also offers a unique lease program giving you the reins to run your way without a lot of risk. As a successful, professionally-run company allowing drivers access to members of leadership, Summit’s proudest accomplishment is our reputation for having the industry's most courteous and experienced drivers. Don’t wait, now's a great time for you to Find Success at Summit!